Tyndale was a humble man. He always wanted to do better and he welcomed sound criticism. But he had a message for men who took his translations, changed them, and then promoted their work as a “diligent correction.” With a moment’s thought, we will realize that this would in any event be the height of effrontery. But when it came to God’s word, which Tyndale loved as gold, and over which he laboured painstakingly to make true and faithful, he had every right to be indignant. There were a few offenders, but here we’ll see two. Here endeth the new Testament diligently ouersene and corrected, and prynted now agayn at Antwerpe … In the yere of oure Lord m.cccc. and xxxiiij. in August. Preface, 1560 Geneva Bible: We thought that we should bestow our labours and study in nothing which could be more acceptable to God and conformable to his Church than in the translating of the Holy Scriptures into our native tongue; the which thing, albeit that divers heretofore have endeavoured to achieve [i.e. Tyndale and Coverdale], yet considering the infancy of those times and imperfect knowledge of the tongues, in respect of this ripe age and clear light which God hath now revealed, the translations required greatly to be perused and reformed. They then went on to revise the Scriptures and promote it as a corrected Bible. It is lawful for who will to translate and show his mind, though a thousand had translated before him. But it is not lawful (thinketh me) nor yet expedient for the edifying of the unity of the faith of Christ, that whosoever desires should by his own authority take another man’s translation, and put out and in, and change at pleasure, and call it a correction. If the text is left uncorrupted, it will purge herself of all manner false glosses, however subtly they be feigned, as a seething pot casteth up her scum. But if the false gloss is made [to be] the text “diligently overseen and corrected”, how then shall we correct false doctrine and defend Christ’s flock from false opinions ? Don’t touch my translations, he said. Leave them alone. Or if they must steal and change it, call it their own, and put their own names to it, and leave him out of it. But did Tyndale request that his work be corrected? Notwithstanding yet I submit this book, and all others that I have either made or translated, or shall in time to come (if it be God’s will that I shall further labour in his harvest), to all who submit themselves to the word of God, to be corrected of [by] them, yea and moreover to be disallowed and also burnt, if it seem worthy when they have examined it with the Hebrew, so that [provided] they first put forth of their own translating another that is more correct. People have seized on these words to argue that Tyndale would have welcomed the Geneva and KJV “corrections.” But this overlooks his last sentence. Let them correct as they will, he says, but by means of their own translation – and, furthermore, don’t cast his aside until theirs is done. So, Tyndale did not want men tampering with his work. Truth be told, there are only two true “diligent corrections” of Tyndale’s New Testament. Those are the two he performed himself, one in 1534 and the other in 1535. However, it was no doubt in the providence of God that Tyndale’s work furnished the base of the major English Bibles. Computer studies have shown that over 83% of the KJV New Testament is straight Tyndale. We may thank the Lord for not answering Tyndale’s prayer, however much we know that he would regret many of the changes made. His voice was largely preserved, especially in the New Testament, and has been greatly used by the Holy Spirit. However, it cannot be said that Tyndale wanted his work to be corrected this way. 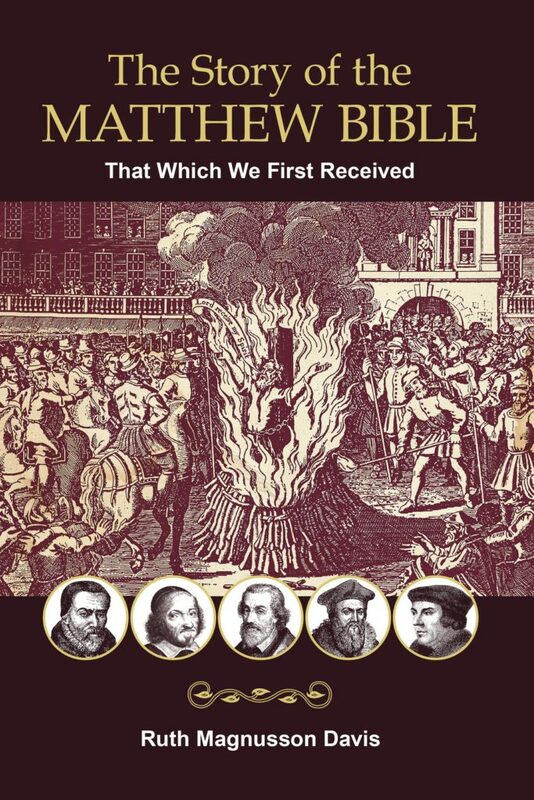 To learn about Tyndale’s work with the Scriptures, and his friendship with Myles Coverdale and John Rogers, which led to the making of the Matthew Bible, read our new book, The Story of the Matthew Bible. Herbert’s Catalogue of Printed Bibles, page 6. 2nd foreword to Tyndale’s 1534 New Testament, modern spelling edition by David Daniell, page 13. Preface to the 1560 Geneva Bible. Reproduced in 1599 Geneva Bible, modern spelling Tolle Lege edition, beginning at p. xxvii. Tyndale, 2nd foreword, 1534, pages 13-14. Tyndale, “W.T. to the Reader,” 1530 Pentateuch, David Daniell’s modern spelling edition, pages 5-6. Obsolete English and punctuation may be silently updated in quotations from the early 16th century.